Originally named The Fab Four they were the first Beatles tribute band to play the Cavern when it re-opened and are mentioned in music writer and Merseybeat historian Spencer Leigh’s book ‘The Cavern, The Most Famous Club in the World’. Their performance as The Beatles is unique, uncontrived and mind blowing, their show is without doubt exciting and not to be missed! Like John, Paul, George and Ringo Made in Liverpool are all Liverpudlians and they naturally sound like The Beatles. 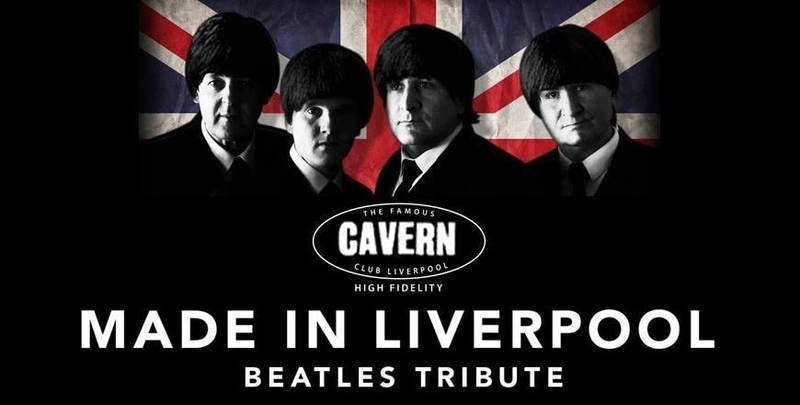 Enjoy an experience at The Cavern Club that you’ll remember, from a world class Beatles tribute band, playing the music of the four lads who shook the world, where it all began, in the most famous club in the world. Gaz Fearnhead (Paul McCartney) – Takes the role of Paul McCartney and, with not only having more than a passing resemblance to the great man, he sounds seriously like him too! Gaz has played the part of Paul in several renowned tribute bands and also in musical theatre productions throughout the UK He’s is a multi instrumentalist, coming from a musical and theatrical background. A second, unrelated passion is running and keeping fit and, as well as gym work, he’s completed some of Britain’s highest profile marathons – on many occasions raising money for charity and causes. Richard Knight (John Lennon) – Richard performs the part of John Lennon and has been a Musician/singer/song writer with many cover and Beatles tribute Bands in the UK and overseas. He’s also taken on acting roles in musical theatre productions, one being an operatic performance set in Victorian London based on the story of Jack the Ripper and the Whitechapel murders. He’s also had parts in Beatles related theatre performances as John Lennon, including the critically acclaimed Sergeant Pepper’s Magical Musical Trip at the legendary Liverpool Everyman theatre and has links with the Liverpool Beatles industry. Lee Jay (George Harrison) – Lee plays the part of George Harrison in Made in Liverpool Beatles Tribute and started playing piano, guitar, bass and drums at the age of six years old, as well as performing as George in the band he’s written and arranged his own music and does session work in studios for other artists and has played as a solo Musician and with duo’s in Spain,Greece and other tourist areas of Europe. Mike Wynne (Ringo Starr) – Drummer and percussionist with Made in Liverpool, and once met the legendary iconic jazz drummer Buddy Rich and names him as one of his biggest inspirations and influences. Like the rest of the band he’s been an avid fan of The Beatles music since he first heard them as a child and has always contended that Ringo was highly under rated and was indeed such a critical factor in the Fabfour’s rise to fame. Mike’s dynamic drumming and melodic vocal abilities have been part of many of his musical ventures, including touring overseas and playing with his former Band Rubber Soul.